Size 2, left by the roadside. 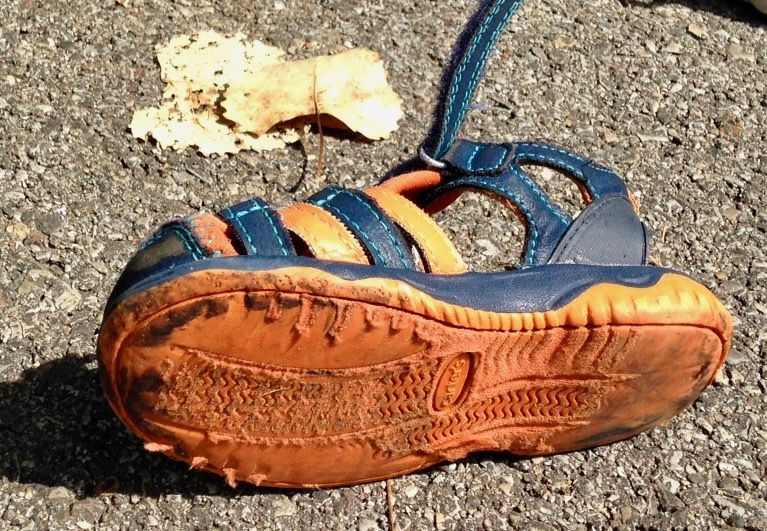 Late July, as the heat of the summer gets bogged down in humidity from the Gulf, a small child’s shoe appears on the side of the highway by our home. It resides sole down in the gutter, separated from its partner. How many times do you see one shoe on the roadside, and wonder how it can be alone? Where is its completing half? You imagine scenarios where the owner opened the door of their car on the roadside to change shoes, pulled off one, and then thinking better of it, closed the door and pulled away half shod. 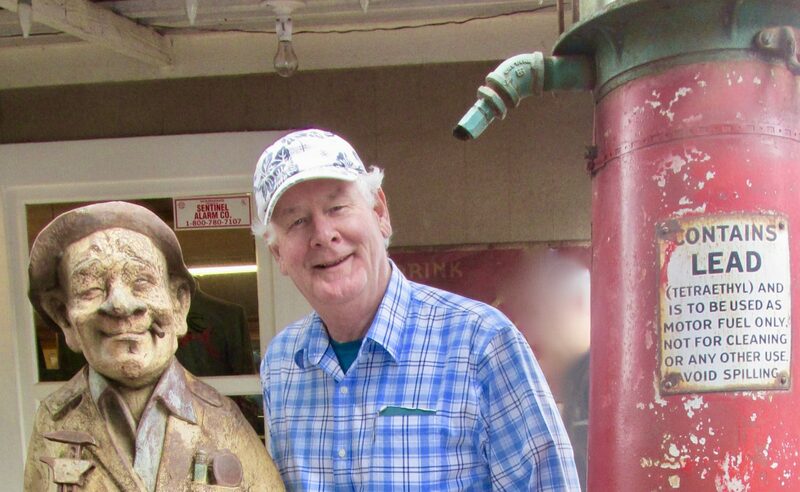 Miles down the road, or perhaps at the next rest stop, the owner owns up. They only have one shoe, so dumps the other. Given the choice of using a garbage can or not, they place the shoe on the sidewalk, maybe in the hopes of completing someone else’s broken pair, or more manipulative, to puzzle the casual observer. 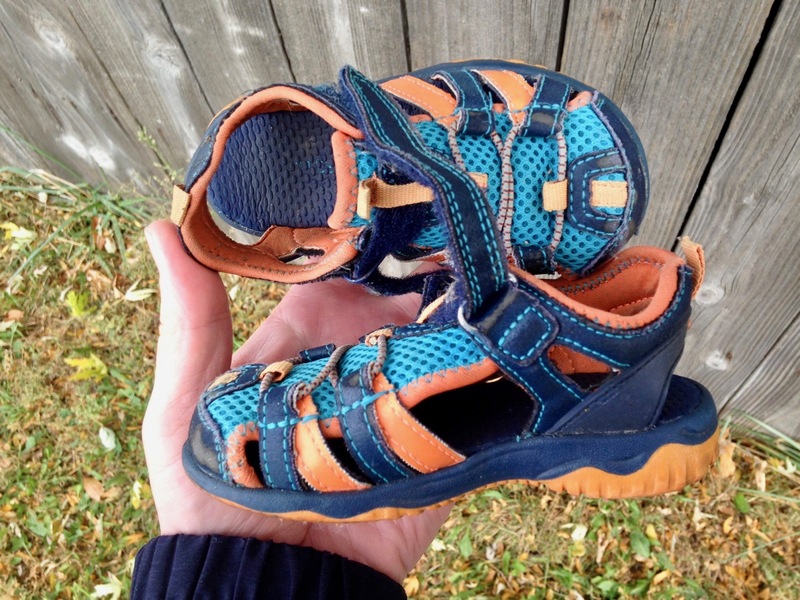 But back to the blue and orange size 2 sandal. It’s surrounded by gravel and twigs, and passed by approximately 20,000 cars a day. A half mile up the road, its other half sits in the center lane of the highway. The story clarifies. 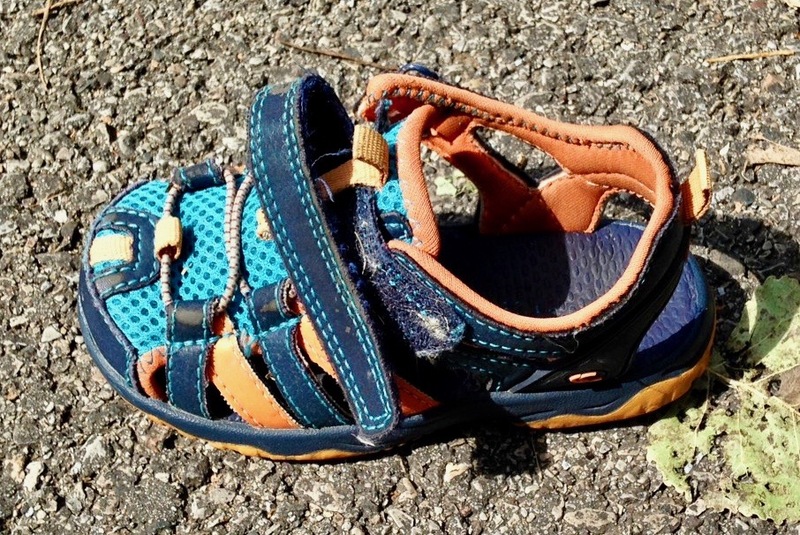 This is a pair of children’s summer sandals that departed a speeding car. Northbound, considering the placements. The most likely explanation is that the shoes never made it beyond the trunk lid, or the roof of the car when the owner’s family left home, or the beach. I admire their construction: tidy miniaturized engineering, with Velcro for fast escape. Once in Kauai I had doffed my runners at the beach, and after a dunk in the Pacific walked back to the car barefoot, waiting for the wet sand to fall off my feet. I placed my shoes on top of the car while loading chairs and picnic supplies back into the car. In a moment of moral abandon, I stepped into the driver’s side and decided to drive the one mile trip home, barefoot. Held up at a bridge along the way, the car behind us honked their horn and pointed to the roof. Doh!! So it could be that a distracted mom or dad had likewise left the shoes on top of the car, and they blew off along the way. Another possibility is that the child who was wearing the shoes took them off inside the car, and pitched them out an open window. A little difficult considering the belted seats kids ride in, but still possible. A quite serviceable pair of wheels. Pre-owned. Then again, it could be that the child’s spiteful sibling removed the shoes and did the deed, in revenge for an earlier insult from the owner. Who knows? But what remains is the mystery of no recovery. In our young child-rearing days everything had an accountability for completeness. Count the Jenga before they went back into the can. Check under the couch for errant Lego pieces before packing it away. All the riders in their places on the Fisher Price School bus before it went onto the shelf. How is it that a mom or dad didn’t wonder about the missing shoes? 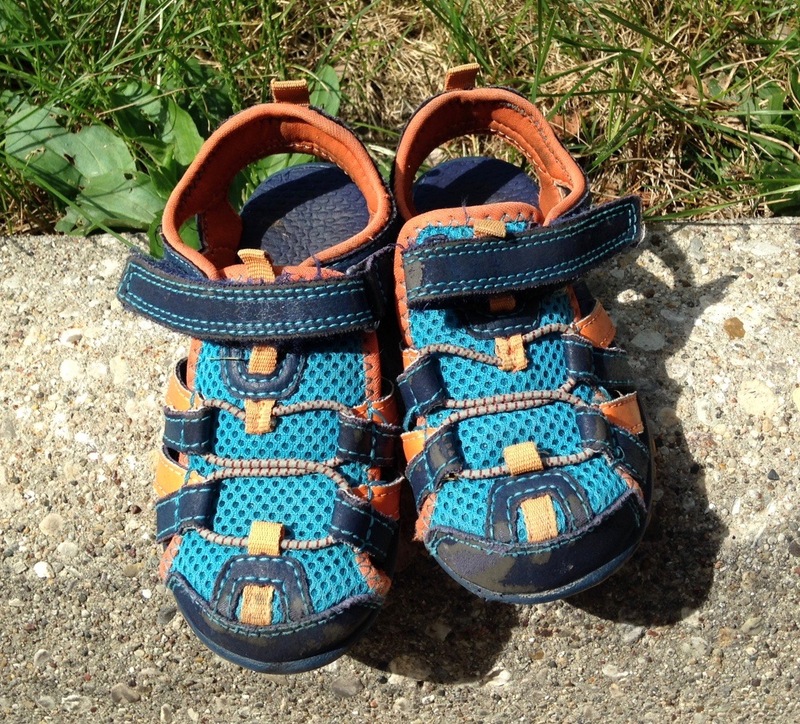 Our oldest boy, at the age of 3 had a worn out pair of wing tips that he enjoyed every day. He loved those shoes. If bedtime hadn’t been preceded by a bath, he would have worn those loafers under the covers. One day we announced that his feet were too big, and he needed new shoes. He absolutely refused to give them up. Stonewalled us, and it was only after I promised that we could keep them that he accepted a new, bigger pair. 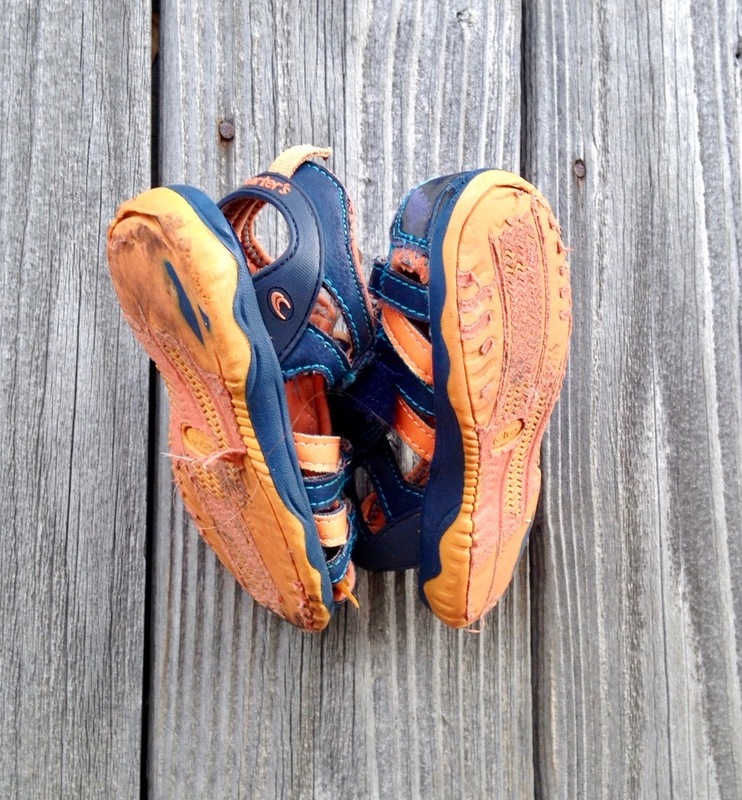 Small, plump little dusty feet once wore these. Went right over his head. But the lesson remains, that small children become attached to shoes as keepsakes, and it puzzled me that no parent had come back to retrieve the shoes. After all, there they were, a half mile apart on the same road. What would it take to stop? Realistically, it isn’t safe to stop, so perhaps the parent, one of the 20,000 which pass by everyday closed their eyes to the daily reminder that their child’s clothing was lying there in full view, and they were powerless to change it. August passed by, and just before Labor Day my obsession with the separated pair overwhelmed me. Riding my bike down to shoe #1, I picked it up when there was a pause in traffic. The shoe was in pretty good shape. Maybe a little worn on the bottom. Heavy duty blue nylon webbing on a da-glo orange rubber sole. It was tethered by a Velcro tab. At the time I flashed back to long ago, and imagined a tanned, slightly dusty, fat little foot occupying such a sandal. Next I pedaled back to its mate about three blocks away. That one was resting on the yellow striped line of the middle lane, also in clear view of 20,000 motorists through July and August. Now I had a pair of child’s sandals. Presentable condition, hardly used. My thought was to place the two together on the curb. Perhaps then the owner could recognize the gesture of a stranger, and stop to pick them up, joyfully reuniting the shoes with their owner after a two month loss. Cast aside in fun, or forgotten? Instead of the curb however, I hung them on a nail in our fence. A few yards beyond was a cut out in the road where a car could exit, and stop safely. A quick jog to the fence, and the shoes would be in the car again, the starting point of their summer time escape. Since Labor Day, by rough estimate, 1,000,000 cars have passed the shoes. No one has stopped to bring them home. I wonder, daily, why not? My best hope is that the original trip was unique. That car and its young passengers have never chosen the same route since. My next best guess is that the owner has driven by and weighing the effort of retrieval against the usefulness of a pair of summer sandals in October has resolved to abandon the pair. My thoughts don’t want to venture a third possibility. What I have decided is that before the snow flies, I will take down the shoes from their nail, and give them to the local shelter. They will be worn again, hopefully by someone who will cherish them for their comfort and character. They’ve been on the road. Thanks for reading and sharing! This pair of shoes has been on my mind for months. Awesome post. Retirement must be good to reflect on such weighty topics. Any interest in meeting for dinner a week from now – Wed 11/2 ? More than weighty. But not to the worry I take over which pattern to mow my lawn each week. Circle, diagonal, random… it’s tough! Hi Phil, as always you manage to touch a nerve that challenges my memories of happy days from another time. Thanks for that. Best Regards to Jane. Allan Gross. Hi Allan! All the best to you too. The kids time was the best, but I do enjoy the grandkids too! What a cool idea for a story! Those are really cute shoes. It’s a shame they were discarded. And to be sitting on the highway, for months, at night, alone. Glad you rescued them, Phil! Hey Peter! Yep, all God’s children gotta have shoes, hence my puzzlement at this abandoned pair. Good luck, but not too much luck in the World Series. Go Cubbees! Great story Phil, thanks so much for sharing.